The Pennsylvania House Republican Caucus held a press conference on the steps of the capitol rotunda joining the chorus of physicians and hospitals asking the Supreme Court Civil Procedural Rules Committee to hold off changing the venue rule. The current venue rule requires that medical professional liability actions be brought in the county where the alleged action took place. Republican lawmakers argued that removing this exception from the procedural rules will likely lead to higher jury awards and higher premiums. The Pennsylvania Supreme Court’s rulemaking body is trying to change the current rule on venue in medical liability cases that requires a case against a physician must be brought in the county where the alleged incident occurred. Changing this rule is likely to have a negative impact on the accessibility and affordability of medical professional liability insurance. The reason is that trial lawyers will be free to use any connection necessary to bring a liability action into Philadelphia, which has a reputation of awarding high jury awards. POMA is working on drafting its comments opposing the rule change. Additionally, POMA is in a coalition of healthcare provider organizations, insurers and others to oppose changing the rule on venue. POMA has also become a member of the Pennsylvania Coalition for Civil Justice Reform, which formalizes its opposition. The 203rd General Assembly took the oath of office in Harrisburg on January 1. Representative Mike Turzai (R-Allegheny) was re-elected as the Speaker of the House and the Democratic Leader remained the unchanged as Representative Frank Dermody (D-Allegheny) was reelected to his post. In the Senate, the new President took the oath of office, Lieutenant Governor John Fetterman (D). The Senate Republicans reelected Senator Joe Scarnati (R-Jefferson) as the President Tempore and Senator Jake Corman (R-Centre) as the Majority Leader. The Senate Democrats voted Senator Jay Costa (D-Allegheny) and the Democratic Leader. In addition to the leadership, the Committee chairs for all four caucuses have been announced. Please visit the POMA advocacy page for more details on these legislators. POMA heads into a new 2-year, state legislative session, in January. Physician leadership, POMA staff and consultants are collaborating to enhance and sharpen the organization’s advocacy capabilities. We are developing ways to foster communication between POMA members and their state legislators. 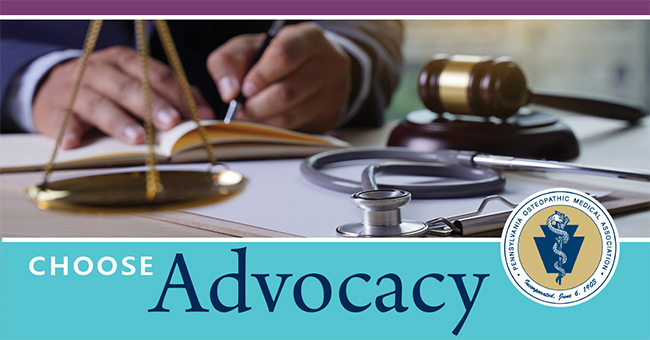 Better known as “grassroots lobbying”, and a significant portion of the strategic plan, POMA will enhance the velocity and timing of getting information into member hands, so each physician, resident and student can be heard by the state legislators that represent their home district.